Among the stark numbers in the federal report was the one signaling a high number of suicides among people without a known mental health condition. 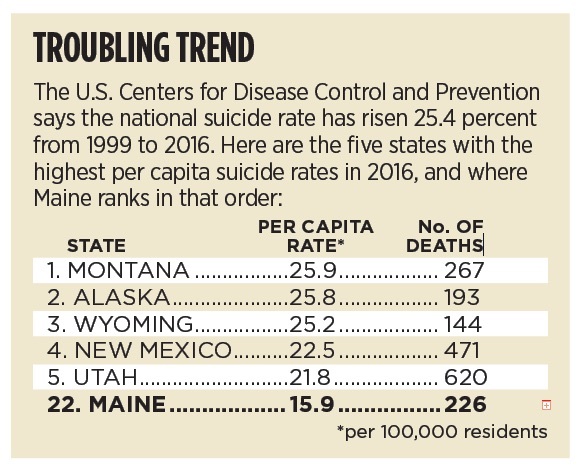 In Maine, the rate of suicide increased by 27.4 percent, which was slightly higher than the national rate of 25.4 percent. Twenty-seven other states had higher increases than Maine, including eight states that saw increases of 40 percent or more, led by North Dakota’s 57 percent jump. In the most recent period studied (2014-2016), the rate was highest in Montana at 29.2 per 100,000 residents, compared with the national average of 13.4 per 100,000. Only Nevada saw a decline – of 1 percent – for the overall period, though its rate remained higher than the national average. Increasingly, suicide is being seen not just as a mental health problem, but a public health one. Nearly 45,000 suicides occurred in the United States in 2016 – more than twice the number of homicides – making it the 10th leading cause of death. Among people ages 15 to 34, suicide is the second leading cause of death. High suicide numbers in the United States are not a new phenomenon. In 1999, then U.S. Surgeon General David Satcher issued a report on the state of mental health in America and called suicide “a significant public health problem.” The latest data at that time showed about 30,000 suicides a year. Kaslow is particularly concerned about what’s emerged with suicide among women. The CDC report comes at a time of heightened attention to the issue with the suicide this week of designer Kate Spade. The designer’s husband, Andy Spade, has said she suffered from depression and anxiety for many years. Press Herald staff writer Eric Russell contributed to this report.